I don't know what to do about the nest. A robin has built a perfectly circular nest in the center of my hanging pot of pansies, decorative flowers I'd hung on the front porch for the open house. Now my home is sold, and I will move in a few weeks. I don't know if I should leave the hanging pot or bring it with me. I keep waiting for the robin's eggs to appear. Every few days, I water the flowers, gingerly, when I am sure the bird is not at home. Last week, I warned the mail carrier away as he came up the walk. "Please leave the mail on the bottom step," I whispered through the front door screen, pointing toward the flower pot. He looked startled. "The nest," I explained. He put down the bundle of letters and backed away. Today, the robin has been gone all day. I keep anxiously looking out the front window to see if she's returned. "You shouldn't have watered the flowers, Mom," Thomas, my 11-year-old son, tells me. "Birds can smell your human scent. You've probably tainted her nest." He uses words like "tainted" because I am an English professor. "I don't want the flowers to die," I protest. "What's more important, the flowers or the bird?" he asks. I don't want to choose. When my husband and I bought this house together—half a house, really, the bottom floor of a two-family home outside of Boston—I was a pregnant graduate student. We scraped together our down payment by working as adjunct lecturers and living in a small rental apartment. A few weeks before my due date, I was swollen and uncomfortable; the baby was breech, his head wedged inside the tight nest of my ribcage, unable to turn. "What should I do?" I asked my doctor. So I planted a garden, digging a small plot of dirt at the edge of the driveway. I weeded, watered, and tended it, lovingly, until my back throbbed and my swollen fingers ached, as if my child's life depended on it. After the baby was born, my summer harvest flourished into fat tomatoes, succulent green beans, and huge, mutant-looking zucchinis, like pods from Invasion of the Body Snatchers, crawling along the driveway's edge. We had to be careful not to crush them with the car. Surveying my bounty while breastfeeding my infant son, I felt like mother earth incarnate, ripe with love. Then came the day that my husband found me sitting in the garden. Bleary-eyed from lack of sleep, dirt beneath my finger nails, I was biting into a large ripe tomato with the baby latched onto my left breast. The perfect food chain. "Isn't it a miracle that I'm keeping our offspring alive with my body?" I smiled up at him. He shrugged. "Formula could do the same thing." Baby robins require massive amounts of food in their first two weeks, I learned, researching robin behavior while waiting for the eggs to hatch. Alone in the nest, the young are vulnerable to predators, so the parents forage close to home, making up to 100 short feeding visits to the nest each day. One could call this instinct, but I prefer to see it as a labor of love: a bird's single-minded focus on feeding and protecting its young. Our son was only three years old when my husband went away with his lover, a female professor who did not have children. They decided it would be a good idea to fly to Paris together for the summer while I taught classes and looked after Thomas alone. "If you were unhappy, why didn't you tell me?" I begged my husband before he left. "Why did you have to bring a third party into our marriage?" "You brought a third party into our marriage three years ago," he shot back. That summer, I was grateful for a daycare worker named Sara, who helped Thomas plant a tiny green bean in a Styrofoam cup full of dirt. We placed it carefully on our kitchen window sill and watered it a little each day. Miraculously, one long, thin bean grew from that spindly plant inside the foam. When it was ripe enough, we had a solemn ceremony to harvest the bean. Thomas picked it, then gently passed it to me, like a nurse handing the scalpel to the doctor in a delicate surgery. He watched me steam the bean, then season it with salt. I tucked a napkin under his chin, and served it to him on a small china plate. He ate the bean with patient, tiny bites, like Charlie Bucket savoring his candy in Charlie & the Chocolate Factory. "My bean is good," Thomas said, happily. "I love my bean." "Where's my daddy?" he asked. After my divorce, I was determined to keep my place, which I couldn't afford. If I kept everything outwardly the same, I thought, then I could protect Thomas from further impact. Keeping the house became a symbol of my maternal strength, of rebuilding my life, piece by piece, like the robin building her nest twig by twig. There were days when I didn't eat so that Thomas could; nights when I sat in my little garden in the dark and wept as my child slept, feeling that I had failed him by not having the power to keep his father at home. 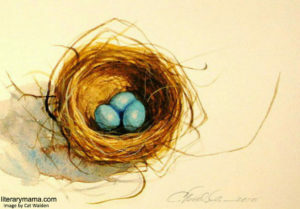 Finally, the eggs arrive: three small blue ovals nestled sweetly in the middle of a cocoon of bright yellow pansies. I discovered them while sneaking onto the porch with my watering can at dawn. The nest looked empty; I wanted, badly, to look inside. Teetering on a wobbly step stool, I peeked in; just at that moment, the mother robin swooped down, squawking angrily. I jumped off the stool, dropping the watering can with a clatter. "Sorry!" I cried, sidling back into the house. Thomas was standing in the living room in his Spider Man pajamas, which he'd clearly outgrown; the bottoms stopped an inch above his ankles. His shock of blonde hair was tousled from sleep. "Don't do that again," he said, and shook his head. When my ex-husband starting taking Thomas for weekend visits to the new house where he lived with his lover, my lawyer told me I had no choice but to allow it. I'd watch him strap Thomas into the back seat of his car and imagine throwing myself in front of the wheels, screaming, "Please, don't take him there, of all places, not there!" But I could not do this to my son. I knew he needed his father. Instead, I waved goodbye from the window as they drove away. Then I closed all the blinds and curtains and cocooned myself, womb-like, inside my bed covers, waiting in the darkness until Thomas came back home. It's been a cold hard spring; the trees have barely any buds. I worry that the robin will not have enough to eat. I consider buying worms and putting them in the ground nearby for her to find. "Don't do it," Thomas cautions. "The bird will know the difference between store-bought worms and real worms." This advice begins to sound like a parable. I wonder, absurdly, if the robin's presence on the porch is some sort of sign. In many cultures, the robin is a symbol of intuitive wisdom. In some Native American ceremonies, the robin is called upon when clear understanding is needed and quality decisions need to be made. I decide it's best to leave the flower pot behind. I sit down to write a letter to the new owner of our house. Perhaps you have noticed a pot of yellow pansies hanging on the porch. Inside the pot is a particular surprise. The nest of a mother robin and her eggs, which will soon hatch! We don't want to disturb this cycle of nature, so please, be careful about touching the pot. The flowers want attention, and for that I am sorry, but best not to spook the bird. The babies need their mother—p.s. We don't know where the father is. I crush the letter into a ball and push it to the bottom of the kitchen trash. They've bought a house, not an aviary. By the day the moving truck arrives, the babies still have not hatched. "Is that going?" the mover asks, seeing me staring up at the flower pot on the porch. "No," I tell him. "It stays." My reluctance to leave behind the robin's nest, I realize, is tied to my ambivalence about saying goodbye to the earth mother I once was here—breastfeeding and growing ripe tomatoes—unaware that my marriage was falling apart. Leaving this place feels at once terrifying and exhilarating, like skydiving in free fall before pulling the parachute's ripcord. But I know the robin's nest is also temporary, a structure built only to protect her eggs. Eventually, she will move on, find another mate, and leave the broken shells behind. "All set?" my boyfriend, Neil, calls to me from the driveway. He is waiting to drive me to our new house. His two teenage boys and Thomas are laughing together in the back seat of the car, excited to get to our new place and choose their rooms. "Yes," I call back, "be right there." As I turn the key in the lock for the last time, I watch the robin fly up to a tree branch nearby. She turns her head sideways, eyeing me warily, before she flutters safely back to the hanging pot. Once inside the cradle of flowers, the robin points her beak toward the sun. All she can do now is wait. Kristina Wright is an Associate Professor of English at Southern New Hampshire University. She has published poetry in The Worcester Review and The Midwest Quarterly, among others, and a memoir essay in Brain Child: The Magazine for Thinking Mothers. Kristina lives outside of Boston with her partner, Neil, and their happily blended family of three boys. This is an absolutely beautiful essay. I hope to read more from this writer.